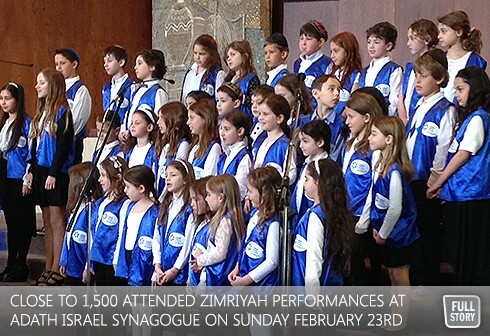 On Sunday, February 23rd , UJA Federation’s Julia & Henry Koschitzky Centre for Jewish Education held Zimriyah 2014*5774, the annual Toronto Jewish schools’ choral festival. Over 500 students representing GTA’s day and supplementary schools participated. Close to 1,500 parents, grandparents and friends attended the morning and afternoon performances at Adath Israel Synagogue. Led by renowned Musical Director, Cantor Eyal Bitton, the students musical presentations were performed in school groups and as a community ensemble. Special thanks to Cantor Eli Kirshblum and the staff at Adath Israel Congregation who attended to every detail to ensure that the event ran smoothly and the CJE team whose assistance made this a truly memorable occasion. Olivia Wise was an inspiration to people the world over. At the city wide Zimriyah choral festival in Toronto, The Leo Baeck Day School honoured Olivia's memory with a special musical tribute.